You will find more value in NCPA today than ever before. As committed partners in your success, we continue to strengthen our programs and develop new benefits to serve you. We are the Megaphone for Your Voice. 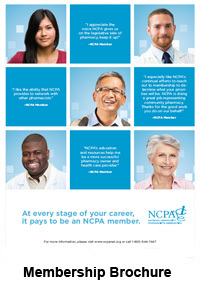 NCPA is the indefatigable voice of community pharmacy. We work hard to protect our members' needs and convey the value they bring to patients and the communities you serve on the national and state levels. Exclusive Benefits Provider. NCPA members are entitled to exclusive deals and discounts for programs and services you need to excel in business and deliver the best care to your patients. These benefits include valuable communications, our medication synchronization program Simplify My Meds® and robust digital and communications solutions through our exclusive benefit with Digital Pharmacist. A Powerful Growth Engine. We offer invaluable training, tools and resources to help our members build and accelerate the growth of their businesses. From new technologies to business marketing training to continuing education conferences, members are exposed to a wealth of leading-edge thinking and tools to make their businesses more efficient and profitable. Connecting a Vibrant, Expert Community. With a network of more than 22,000 colleagues around the U.S., we help pharmacists tap into their peers to learn, share ideas, get fresh insights and grow in their profession. Unparalleled Experience. For 121 years, NCPA has served the 22,000-plus independent community pharmacies across the United States. That's a lot of experience under our belts. We have evolved to meet each new challenge and opportunity over the years, and we're always looking to the future to bring the very best resources to our members, paving the way for their ongoing success.